For most Windows 10 deployments, organizations are removing most of the built-in apps that ships with the operating system. However, in situations when this is not dealt with, for various reasons, you might get some unwanted notifications in the Action Center. Get Office is such an app that will periodically notify the end user with various suggestions. These notifications can be turned off in the Notification and Actions part of the new Settings app in Windows 10, with a single click. That will not work though when you’re deploying operating systems, instead you’d need some script to perform that action. In this blog post, I’ll share a script that I’ve put together based on Jörgen Nilssons original idea leveraging Active Setup for operating system deployments, in order to amend or configure registry settings. This is necessary though, due to the fact that these notification settings resides in the current user hive of the registry. Configure Notification Actions in Windows 10. This script serves as a template to successfully configure different settings related to Notification Actions in Windows 10, that requires manipulation of the registry. Active Setup is leveraged to perform a run once experience per user. This mode is the initial mode that should be invoked e.g. during operating system deployment with MDT or ConfigMgr. Script is copied to C:\Windows and Active Setup is prepared. This mode makes sure that the script is re-launched during Active Setup in order not to prolong the logon experience for the end user. This mode performs the actual configuration notifications in Windows 10. 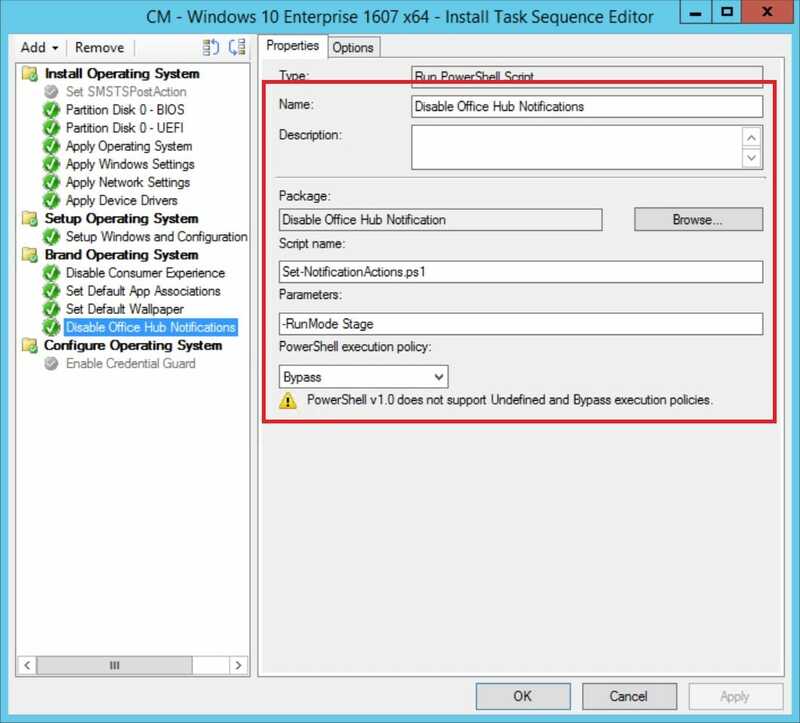 Use only the Stage run mode to prepare the system for Active Setup and notification action configuration changes. Write-Warning -Message "Unable to prepare ActiveSetup key. Error message: $($_.Exception.Message)"
Write-Warning -Message "Unable to create OfficeHub key. Error message: $($_.Exception.Message)"
Write-Warning -Message "Unable to create Enabled value. Error message: $($_.Exception.Message)"
Save the above script as e.g. Set-NotificationActions.ps1. 1. Create a Package in ConfigMgr pointing to the content source where the Set-NotificationActions.ps1 script has been stored. Do not create a Program for this package. 2. In your task sequence used to deploy Windows 10, add a Run PowerShell Script step at some point after the Setup Windows and ConfigMgr step called e.g. Disable Office Hub Notifications.